Professional Rolling Makeup Case Black Professional Rolling Makeup Case Black [SB-308] - $149.99 : MegaDiscStore, Your choices of High quality CD DVD Blu-Ray Replace cases! The perfect make-up case for the Professional Make-up artist and Hairstylist. 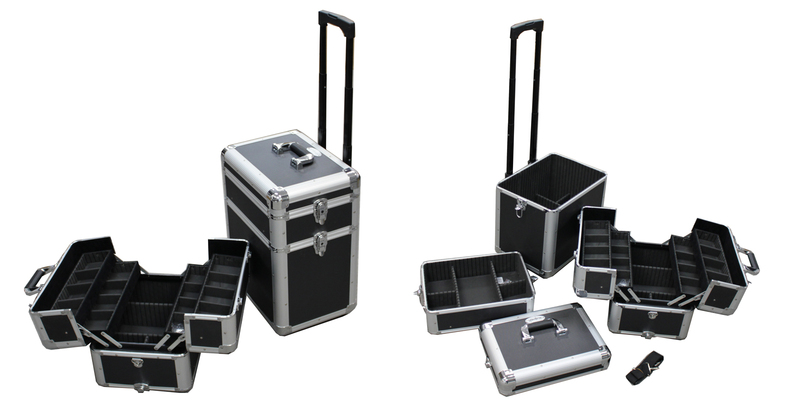 Three large detachable Mini-Cases to organize all your tools and accessories. Fits tall skin care and hair care bottles easily. Detachable roller cart is convenient. Fits tall Skin care and Hair Care Bottles Easily. vinyl material at the bottom of the case to make it easy to clear. Retractable/telescoping handle for easy rolling. Top portion comes with comfortable strap.